Another piece added to Parallel reality page. Replaced a photobook project at "Proexpedition" by the updated local copy: "50 roads". This page displays fifty roads from assorted regions of Earth. The captions are in Russian, however you can still view pictures:). "Timeline of Science" (in Russian) appended with three dozens of events, mainly in "Informatics" category. All travel photo reports equipped with fullsize photos (1.5 Mpix) available by clicking on previews. Added Summer-2018 journey (Scandinavia) to the "Travel" section. Added Winter-2013 journey (Karelia) to the "Travel" section. Updated meta-information on all pages and added "Share current page" feature in the upper-right corner. Added six new mini-reviews to Film reviews (in Russian). Commerical design section updated: added "Offroad" and "GlyTouCan" ensigns; updated images in "CSDB", "Conference web-sites", and "Icon sets" pages. 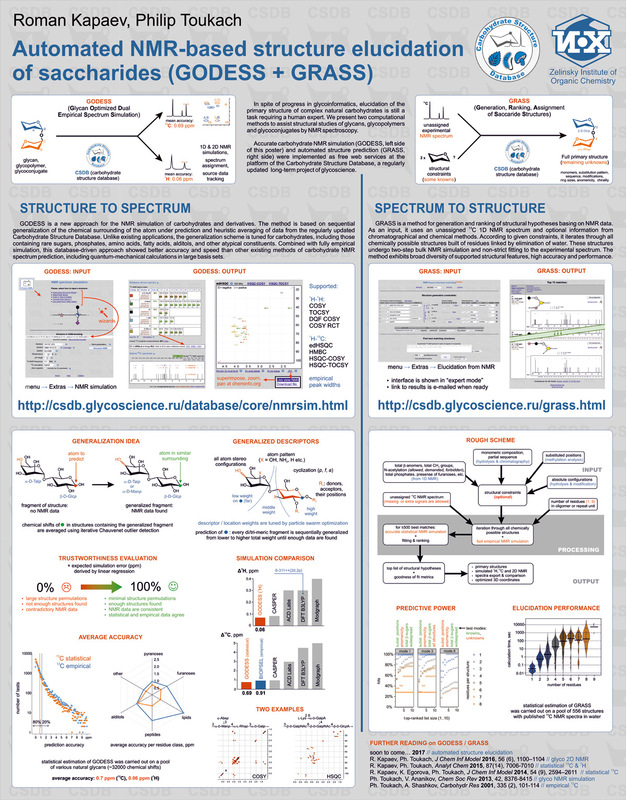 Abstracts of articles on Glycoinformatics and NMR methodology are appended with images (click on the article to view). Added a page about the "Alaska" photo calendar. A sketch (2004) and a drawing (1995) added to Graphics section. The lecture and presentation "Carbohydrate databases" updated. Added several new objects to "Abandons" (Czech Republic). Added curriculum vitae to the page "About author". "CSDB" section appended by invitation to collaboration (in Russian). Fixed style filtering in "audio collection". Photo art display pages now have "Share" buttons. и work well, but is still buggy. New pieces ("Independence Mine", "Gathering for boarding on Kahiltna glacier") added to the "Objects" section. New pieces ("Delivery to Prudhoe Bay across Brooks Range", "Eyak lake bypass") added to the "Objects - roads" section. A new piece ("Copper river view from Childs glacier") added to the "Nature - landscape" section. Added Summer-2017 journey (Alaska) to the "Travel" section. Added three dozen of places to "Visited places" page (Alaska, Slovakia). Added a dozen of new objects to "Abandons" (Alaska). "GODESS/GRASS" section appended with a poster and a list of publications. Copied my film reviews (from torrent tracker Kinozal.TV) to a separate page Comments to films (in Russian). Cleaned and appended Links section. Two pieces added to Parallel reality page. New pieces ("Razdan valley", "Pulkhakim desert") added to the "Objects" section. A new piece ("Suek pass") added to the "Objects - roads" section. A new piece ("Rostok university") added to the "Objects - cities" section. Added a page about the "Middle Asia" photo calendar. A report about East Germany abandoned objects appended by military and industrial abandons investigated in 2016 (in Russian). Must-read from the point of view of becoming a person with a "proper" lifeview (in Russian). Added a dozen new objects to "Abandons" (East Germany). A subsection "Emergency backpack" was added to the touristic equipment list (in Russian version only). Updated the Interactive map of visited cities, scenic views and abandoned objects. Added Summer-2016 journey (middle Asia) to the "Travel" section. Added a dozen new objects to "Abandons" (Kazakhstan, Kyrgyzstan, Tajikistan, Uzbekistan). Added two dozen places to "Visited places" page (Kazakhstan, Kyrgyzstan, Tajikistan, Uzbekistan). Added a dozen new objects to "Abandons" (Armenia). Added 60 new beer labels from the USA. Worth seeing! About 300 new beer caps added. Replaced most of the images in "Portrait", "Nature" and "Object" sections to their larger versions (~800*600 px). Piece #23 in "Portrait" section replaced with a new one ("Hippy don't get older"). Pieces #04, #12 and #13 in "Nature - sun & sky" section replaced with new ones, and new pieces added: #17 (Abkhasia), #18 (Carpathians), #19 (North Ural). New pieces ("Boszhira stow", "Frontier", "Aktash-Ulagan road", "Do not swim behind buoys! ", "Tateyama mounatain") added to the "Nature - landscape" section. New pieces ("Troop fallout", "Doom and gloom", "Time machine", "As after a war", "Samuylovo homestead", "Applied magic", "There, in Russia") added to the "Objects - stillife" section. "Objects - roads & cities" section split into two parts: "Roads" and "Cities". New pieces ("Irkutsk Industrial", "Haca-Pamplona road", "God`s Valley", "Roads that we choose", "Manata pass") added to the "Objects - roads" section. New pieces ("World crossing", "Untouched by war", "One Fullerton", "Djentukha", "Kirillov", "Bar street", "Burger`s dubak", "Firsa") added to the "Objects - cities" section. Updated "GODESS/GRASS" section regarding 1H and 2D NMR simulation. Added more illustrations added to the NMR course, course program and questions updated accordingly. Updated information on "Carbohydrate Structure Database (CSDB)", added a new poster and three new publications. Redesigned "Visited places" page: add city size ranking, emphasized "natural" places in green, rewrote the code to store all data in a database, added regions, added date sorting option and fast navigation links. Added three dozen places to "Visited places" page (Croatia, Bosna&Herzegovina, Montenegro, Kazakhstan, Russia). Added a dozen objects to "Abandoned objects" page (Croatia, Bosna&Herzegovina, Kazakhstan, Perm region, Sverdlovsk region) and rewrote the code to store objects in a database. Added Summer-2015 journey (North Ural mountains) to the "Travel" section. Added Spring-2015 journey (western Kazakhstan - Ustyurt plateau) to the "Travel" section. Added three dozen new objects to "Abandons" (Kazakhstan, Abkhasia). Events listed in "Timeline of Science" (in Russian) were validated, categorized and split into periods. A page was redesigned with a new logo and category color code. Added a dozen new cities to "Visited cities" (Abkhasia). Added a page about the "America without americans" photobook. Changed a photo of myself on "About author" page. A new piece (#35) added to the "Portrait" section. New pieces ("Beartooth mountain", "Shenandoah", "Rainier mountain", "Half-dome and Glacier Point", "Zabriskie Point", "Nymph creek") added to the "Nature - landscape" section. New pieces ("Road 66", #23, "Packard plant", "Navajo shop") added to the "Objects - stillife" section. New pieces (#25, "New Year", "Christopher Columbus highway", #28, #29) added to the "Objects - roads & cities" section. Updated a list and photos of car improvements "Feroza Microclub" page. Added Summer-2014 journey (the USA round trip) to the "Travel" section. Added five dozen new cities to "Visited cities" (the USA). Added five dozen new objects to "Abandons" (the USA, Poland). Updated information on "Carbohydrate Structure Database (CSDB)", added posters and links to publications. Grant and publication list updated. Added a logo and several member photos to Feroza club page. Spare parts list updated. A lecture: "Carbohydrate databases" updated. Added "GODESS/GRASS" section about glyco 13C NMR simulation and NMR-based structure ranking. Added two dozen new cities to "Visited cities" (Abkhasia and west-central Russia). Added two dozen new objects to "Abandons" (Abkhasia and west-central Russia). Made a new section "Travels" with table of contents and an interactive map. Piece #19 in "Objects - roads & cities" section replaced with a new one ("Shanghai of contrasts"). Pieces #03, #04 and #19 in "Portrait" section replaced with new ones ("Mouse launch", #04, #19). New pieces (#32 and #33) added to the "Portrait" section. "Other works" subsection updated with new pieces. Added two dozen new cities to "Visited cities". Added two dozen new places to "Abandons". Combined Summer-2006 and Summer-2013 journeys into a single photo diary in the "Travel" section. Slightly redesigned "Travel" section; added route maps and GPX tracks for 2012 and 2013. Another course added to the Teaching section: "Digital photography and image processing". Added a page "Photographers' faults" illustrating common mistakes of beginners in photography. Updated cinema collection and added a Wiki-link to each film. Spare parts shippping and payment rules added to Feroza club page. A piece "Idealized post-apocalypsis" added to Parallel reality page. Added a table of regions and three dozen new places to "Abandons". Added route maps to all russian travel reports and added a cumulative route map to "Journey" page. Added a lecture: "Carbohydrate databases". Added Summer-2012 journey (Ural, Altay, Baikal) to the "Travel" section. Photos of car improvements applied to my Feroza added to "Feroza Microclub" page. "Travel" section equipped with interactive route map display and a cumulative map for intra-Russian journeys in 2004-2011. Route maps were also added to the supplementary pages to intra-Russian photo sets (2004, 2005, 2006, 2007, 2008, 2009, 2010, 2011). Added two dozen new places to "Visited cities" and "Abandons" pages. New samples added to Symposium web sites page in "Commercial design" section. Changed "Daihatsu Feroza" page to Feroza microclub, updated a vehicle modification list, added a list of used spare parts on sale. From now on, this page is available both in English and Russian. A new piece ("A road to peninsula") added to the "Objects - roads & cities" section. Piece #08 in "Objects - stillife" section replaced with a new one ("November"). Pieces #10, #12 and #15 in "Nature - views" section replaced with new ones ("Seven sisters", "Balancing", "Field demarcation"). Pieces #01, #05 and #07 in "Nature - sun & sky" section replaced with new ones ("Angels of death", "The late randezvous", "Vityaz Bay"). A new piece ("Twain") added to the "Nature - flora" section. Two older pieces removed from the gallery. Four pieces (#06,#10,#13,#21) moved from "Objects - roads & cities" to "Objects - stillife". A new piece ("Cold war puffballs") added to the "Objects - stillife" section. Three older pieces removed from the gallery. Pieces #05 and #08 in "Objects - roads & cities" section replaced with new ones ("Baerenquell brauerei", "The central square"). Pieces #05,#10 and #30 in "Portrait" section replaced with new ones ("Autumn", "October", "The last supper"). A link to coordinates on Yandex Maps is added to every object on "Abandons" page. Added several Feroza-related resources to "Daihatsu Feroza" page. Added two photo sets to the "Travel" section: Summer-2011 (Varzuga-Rybachiy) and Summer-2011 (Spain-France). Added illustrations to the lecture "Modern NMR spectroscopy in structural studies of natural glycopolymers". Six large-scale abandoned objects on German territory added the "Abandons" page. Added a photostory "Abandoned Berlin" (in Russian) to the "Travel" section. Piece #01 in "Stillife" section replaced with a new one ("Roshal"). Piece "Kiev" moved to "Stillife" section. Added new places to "Visited cities" and "Abandons" pages. Bought a domain name toukach.ru. A redirect from the old URL will work for three years. Another course added to the Teaching section: "Web-programming basics". NMR course updated with workbooks, control questions and illustration to lectures (in Russian). A piece "No-craze dreams" added to Parallel reality page. Added event categories to this page (Site history) and made icons for categories. New dreams added to Parallel reality page. Added Summer-2010 journey to the "Travel" section. The "Visited abandoned objects" subpage added. Piece #05 in "Nature - Views" section replaced with a new one ("Contemplation"). Piece #16 in "Nature - Roads&Cities" section replaced with a new one ("Kurilovo"). A new piece ("Dana Mad") added to the "Portrait" section. Pseudo-scientific work Studies of living system worration based on the magnetic field driven sinergization page added to the russian part of the site. Photographer's test (in russian part of the site) recomposed to display random selection from the question pool. Two dozen new questions added to the pool. Parallel reality page added to the russian part of the site. Worra worra page added to the russian part of the site. Olympiads and contests section added to the Grant and publication list. Updated a page for beer label collection with 87 new beer labels. Two new pieces ("The eye" and "Waiting") added to the "Nature - Roads&Cities" section. Piece #24 in "Portrait" section replaced with a new one ("Plastics in dark"). Piece #02 in "Nature - Views" section replaced with a new one ("Gimoly-Vottovaara"). Piece #08 in "Nature - Sun & Sky" section replaced with a new one ("Mideterranian"). A new piece (#24) added to the "Nature - Roads&Cities" section. A new piece ("Earth and Heaven") added to the "Portrait" section. A dozen cities added to the "Visited places" page. Around a hundred of new beer caps added. Added Summer-2009 journey to the "Travel" section. Added vehicle modification information to "Feroza" page (in russian). Two projects (Moscow Chemical Lyceum, Icon sets) updated and one added (Conference web-sites) in commercial part. Added Spring-2009 journey to the "Travel" section. A new piece (#17) added to the "Nature - Sun&Skies" section. A new piece (#30) added to the "Portrait" section. 3 new pieces ("Kiev", "Will be a duel", #23) added to the "Nature - Roads&Cities" section. A new piece ("The last winter") added to the "Nature - landscape" section. Two dozen cities added to the "Visited places" page. A new piece ("Sleeping cars") added to the "Nature - Roads&Cities" section. A piece #2 replaced in the "Portrait" section. A new piece ("Just teleported") added to the "Portrait" section. A new piece ("Abandoned Karelia") added to the "Nature - Sun&Skies" section. New pieces ("USSR traces" and Liberated land) added to the "Nature - Roads&Cities" section. Added Summer-2004 journey to the "Travel" section. Added Summer-2008 journey to the "Travel" section. The "Film collection" section updated. Added new papers and a tutorial section to the list of publications. A page for "Beer and Life in different languages" added. A lot of new beer labels, beer caps, beer mats and beer glasses added to the corresponding collection pages. Updated a page for beer label collection with 396 russian beer labels. Added Spring-2008 journey to the "Travel" section. Added Winter-2008 journeys to the "Travel" section. Added a page for beer label collection and uploaded 324 labels (all except russian). A new piece (#17) added to the section "Nature - Objects". 5 new pieces added to the section "Nature - Roads&Cities". Piece #14 in "Portrait" section replaced with a new one. Piece #20 in "Stillife" section replaced with a new one. Piece #01 in "Nature - Views" section replaced with a new one. Two dozen places added to the "Visited places" page. Added a page for beer glass collection. 2 new pieces added to the section "Nature - Views". 4 new pieces added to the section "Nature - Roads&Cities". New pieces ("The last day of summer" and "Hell stranger") added to the "Portrait" section. Added five dozen caps and beermats to beer cap and beer mat collections, respectively. Added Summer-2007 journey to the "Travel" section. A new piece ("Steel dragon") added to the section "Nature - Roads&Cities". Added a page for beermats collection. Extracted all collections to a separate subdivision. Added a special subcategory for Roads & Cities to display four pieces from Views and three new ones. New pieces (#14 and #15) added to the section "Nature - Sun&Skies". Two pieces (Lights and Spring-22) replaced the older ones in the "Nature - Objects" section. The "Nature - Views" section rearranged, some pieces removed, three new works added (The Wind, Loreley and Autumn-27). Added a page for beer caps collection. Added Winter-2007 journey to the "Travel" section. A dozen places added to the "Visited places" page, and locations are categorized by country. A new page ("Science/technology/ideology history") was added to the russian version of the site. More occupations added to the "Personal data" page. A new piece (Heidelberg) added to the section "Nature - Sun&Skies". Updated archieves of lection slides and control tests for the NMR course. Item #22 in "Portrait" section replaced with a new one. Added a "Travel" section to host existing Summer-2005 and new Summer-2006 and Winter-2006. A "Driving exam" funny test made also available in Russian. All scripts (guestbook, statistics, counter, search engine) rewritten in PHP, Perl CGI programs removed. An "Aluminium constructions" web-site added to commercial part. The driving course added to the "Teaching" subsection. Some funny tests (rock-band, OLGA, photographer (in Russian)) equipped with answer evaluation automate. Fixed a guestbook, and added anti-spambot protection. Fixed a bug with email sending from the Interactive test interpretation page. Three dozen cities in the "Visited places" subpage are completed with photos (click to view). The "pictured test" interpretation has become available in both languages. The interpretation of the "pictured test" is now automatic, while questions/comments can still be optionally sent to the author together with test answers. Grant and publication list updated with a conceptual article. A new piece ("A 1000 year crossover") added. Three new projects added to commercial part Moscow Chemical Lyceum, BCSDB, N.D. Zelinsky Institute. 4 pieces (#21, #22, #23, "Beyond time") added to the section "Nature - Views". A new piece (#16) added to the section "Nature - Objects". A new piece (#03) is added to the section "Nature - Sun&Skies". Items #17 and #20 in "Portrait" section replaced with new ones. Items #25 and #26 added to the "Portrait" section. "August-2005" journey photo-diary subsection added. A new section with five funny tests added. New russian translations added for "Selena" and "Autumn in ZP". The "Visited places" subpage added. A new subsection added: "Bacterial Carbohydrate Structure Database". Grant and publication list updated and new abstracts added. A new piece ("Away from here") is added to the section "Nature - Sun&Skies". Two new pieces ("Light 3", "Light 7") are added. Item #4 (former T-short back side) is replaced with a new piece ("Genesis"). Two dozen items added to "Audio collection". A new piece ("Forever") is added. The design of the whole site has totally changed. 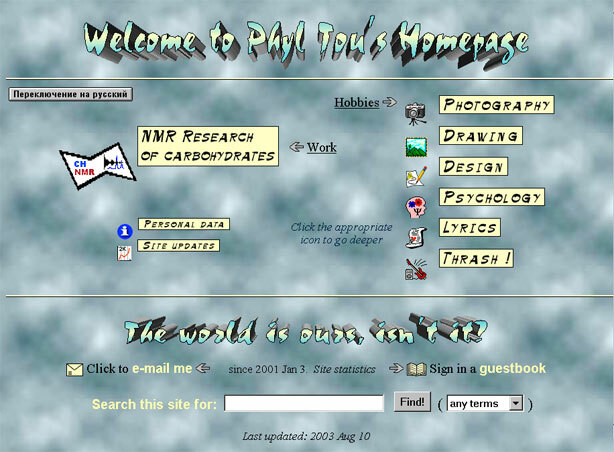 The old version of the site looked like this screenshot. A russian variant of "Finita" added. New lyrics ("Airfield", in russian) added. Piece #15 replaced in the "Portrait" section. Three more expressions (34-36) added to the expression list. All images re-optimized, saving up 1.5Mb (filesize decrease ~15% for photos, ~60% for previews). Grant and publication list updated and a new abstract on The tertiary structure of Staphylococcus auereus cell wall murein is added. Piece #06 replaced and a new piece (#10) added to the section "Nature - Sun&Skies". 4 pieces (#06, #08, #09, #10) replaced and a new piece (#20) added to the section "Nature - Views". The following subsections of the "BIOPSEL" section upfdated: spectroscopic database, residue database, structure generation. The "Rest research" section updated. A partial russian translation of "The Story" added, and some bugs in this verse fixed. The "Teaching" subsection is duplicated in English. The "DVD collection" section added to store the film list. New lyrics ("With the wind") added. The spectroscopic databases within a Biopsel distribution updated. A new piece ("Constructor") added. The "Translations" section expanded with 3 new pieces. A new piece (#19) added to the section "Nature - Views". A scientific humor essay added to the russian part of the site. A link to "Imaging" page added. The "Portrait enhancement" section enlarged by 7 more samples. A new piece ("Life") added. A new design project ("Asinex") added. Two posters of "the NMR Center" added. A new design project "MCL gallery") added. The rest pieces (7 samples) combined into the "Other stuff" section. The "Design" page is split into two parts ("Computer art" и "Commercial"), it's outlook completely changed, image files optimized. A warning about possible problems established for Netscapе users. Corrected bugs (grammar, commas, mistypes) in most verses. A "Personal data" page created to hold formal data and a photograph from the index page. Fixed a bug with incorrect window resize when leaving the index page. A new version of BIOPSEL russian user's manual is now available for download. Structure generation subpage (in BIOPSEL section) updated. Abstract for Proteus vulgaris O44, Proteus penneri 103 and Proteus review, part 3 added/updated. Fixed a bug with interpretation of pictured test. A new program for the NMR spectroscopy course. A new piece (Evening and its variations/fragnments) added. Additional signatures removed from all lyrics. The page "The NMR course" updated with "download carbohydrate nomenclature" link. A HISTORY section created (you are reading it now). A new piece (#18) added to the section "Nature - Views". The page "The NMR course" updated with lection transparencies download link. Animated elements added to the index page. A new link (to the gallery of images gathered over the net) added to the Links section. The section BIOPSEL updated with data on the new version of glycopolumer structure prediction software. The page BIOPSEL updated with structure prediction software (demo) download link. A new equipment list on the "Portrait" page. The common index page created for the imaging-related part of the site. A new banner ("Tou's Imaging") created. A new section ("Translations") added. The page "audio collection" updated with information on some new albums. The page "audio collection" can now filter albums by style (IE only). A new piece ("Polina's morning") added. The piece #14 in the "Nature - Views" section replaced with another one. A new piece (#17) added to the "Nature - Views" section. The piece #13 in the "Nature - Views" section replaced with another one. A new piece (#15) added to the "Nature - objects" section. A new section ("Extracts") added together with link to "Tou's Land" at Dana Mad: fantasy homepage. The MCL graduates database created and the site has been updated with its www-interface. Expressions at "Psycho aspects" equalized. An image on the index page now reacts to mouse-over. If clicked the reaction to mouse-out changes too. A new interactive illustrated test added. A new piece (#09) added to the "Nature - Sun & Sky " section. The publication list divided into thematic sections. The internal file structure of the site was completely changed, allowing to reduce the number of files almost twice. All the pages were updated with new backgrounds. The design of photo galleries has been changed, and new pieces added. The whole site was dubbed in Russian, and an instrument to switch languages has been implemented. 1999: Added a test for screen resolution and color depth at browsing a theme from the index page. If not suitable for correct image display, the loading is blocked. 1998: Added a visit counter, guest book and statistics analyzer. 1997: Added a section for pictures and drawings. 1995-1999: Gradual growth of imaging and lyrics parts of the site. 1995: Added an upper navigation frame. 1994: Created the first version of the site and hosted it at one of the first russian servers - nmr.ioc.ac.ru.